The Original hand mixed and hand packaged Garlic Spread! At Incredible Spread’Em we are homegrown local crafters who love to please. At the beginning of our story, we mixed and packaged our product at home, doubling our production line by buying another bowl! In the beginning, we stored our product in a dozen refrigerators in the garage and dining room of our home. As we expanded, we reached a point where we needed to think bigger; we moved production to a small facility with a walk-in freezer and upgraded to a stand mixer. 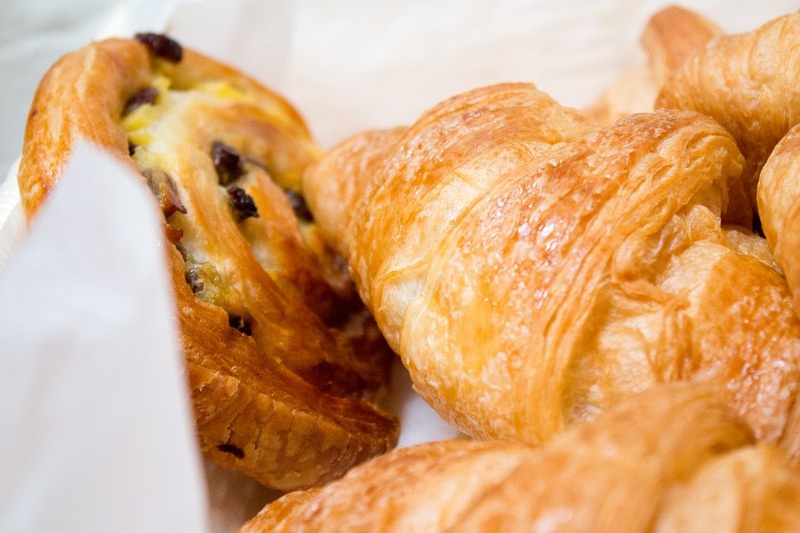 With our wonderful staff, we ensure that our spread is still hand packaged and delivered to our customers with care. We are always looking to write new chapters and grow our Incredible Spread’Em into a story for every meal you bring to the table. 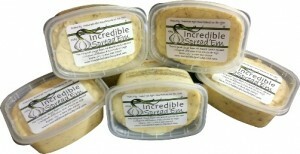 We are the original hand mixed & hand packaged Garlic Spread! Made with chopped garlic, soya bean oil & a variety of dried herbs & spices. Our Spread is cholesterol-free, gluten-free, sugar-free, salt-free & lactose-free. Since 1993, we have proudly been supplying you with Incredible Garlic Spread‘Em, our universally used variation of garlic spread done properly! In the beginning, our operation began in our household kitchen, and as our orders multiplied so did our spatula’s and metal mixing bowls! 23 years later, supply and demand have graciously allowed us to produce our garlic spread in a dedicated facility. Beautifully equipped to ensure production is fresh and delivered timely. We offer great interaction with our customer base, often found at trade shows and markets across Ontario. Wonderfully complemented by the availability to order over the phone, through email and online. The wonderful star and owner of Incredible Spread’Em garlic spread. She Co-Founded this wonderful company with her late husband Al, the “A” in A&M Home Products, back in 1992. Together, they built a brand and a spread worth …spreading! Since then Mary has been working hard to bring her delicious spread to people throughout Ontario and Canada by travelling to many Craft and Trade shows, you may have even met her at one! Through her incredible garlic spread and bright and vibrant attitude, Mary has brought families, friends, and local industry together; with the love of garlic. Our Incredible Spread’Em has a broad following of customers all across Canada and around the world. Due to our growing social media presence and events across Ontario, we expand our audience to new people every day! Incredible Spread’Em is always striving to make our delicious spread more readily available so you can find it wherever you go. Our shipping reaches nation-wide in Canada and we are always looking for ways to introduce our product to new people. By pairing with retail locations, Incredible Spread’Em aims to expand our service to new and existing customers across Canada. We love hearing from our customers and partners, and encourage you to contact us if you have any questions or comments! 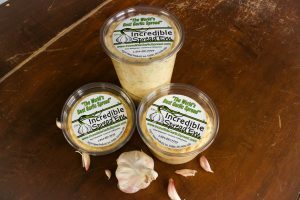 Unlike other commercial garlic spreads, Incredible Spread’Em will last you up to a year in the fridge and can be frozen for up to two years. We aim to make our product as versatile as possible. With the unique flavours of Incredible Spread’Em, you can use it on or in almost anything you cook. It tastes delicious with your popcorn, potatoes, vegetables, meats, and seafood; even with your eggs! 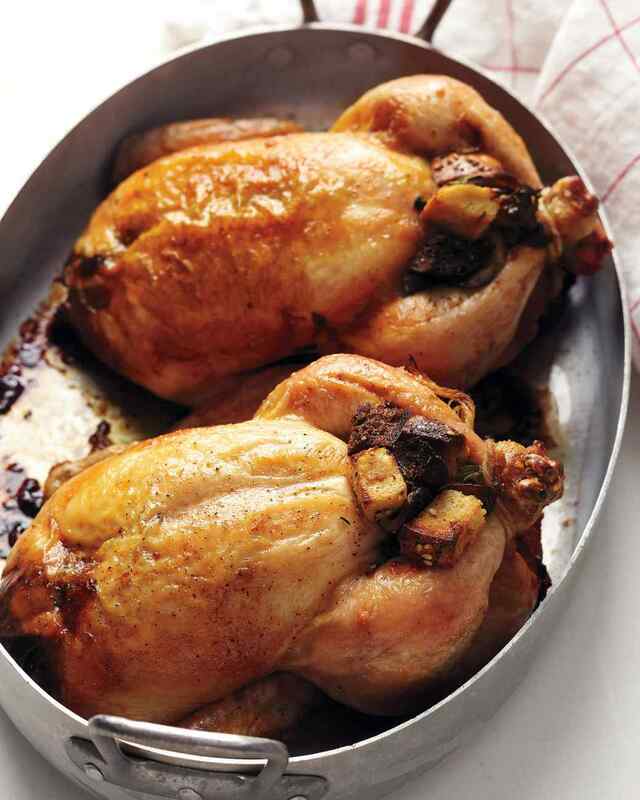 If you ever run out of uses for our Incredible Spread’Em, visit our recipes page to inspire you! Here are some of the latest and greatest ways to use our spread! We are also a proud partner of Cody Wilds and his Glow in the Dark car.